In 2018, POP’s School Orchard Program continued to expand in offering unique, engaging, and hands-on learning activities for students, centered in 9 of 12 POP partner school orchards. In total, we offered 26 unique topical lessons, created 6 downloadable lesson and material packs for teachers to use in their classrooms, made 440 total student impressions through staff visits and lesson plan delivery, and created pre- and post-school year surveys to collect orchard metrics that have value for structuring our programming. All of our delivered programming is centered around our school partners’ learning objectives of those of their students and communities. Last year, we developed and delivered lessons on key orchard fruits and pollinator orchard herbs like blackberries, persimmons, bee balm, anise hyssop, and thyme, that have high nutrient and medicinal value, are well-adapted to this growing region, propagate easily, and have promise for small-scale home or community food production. 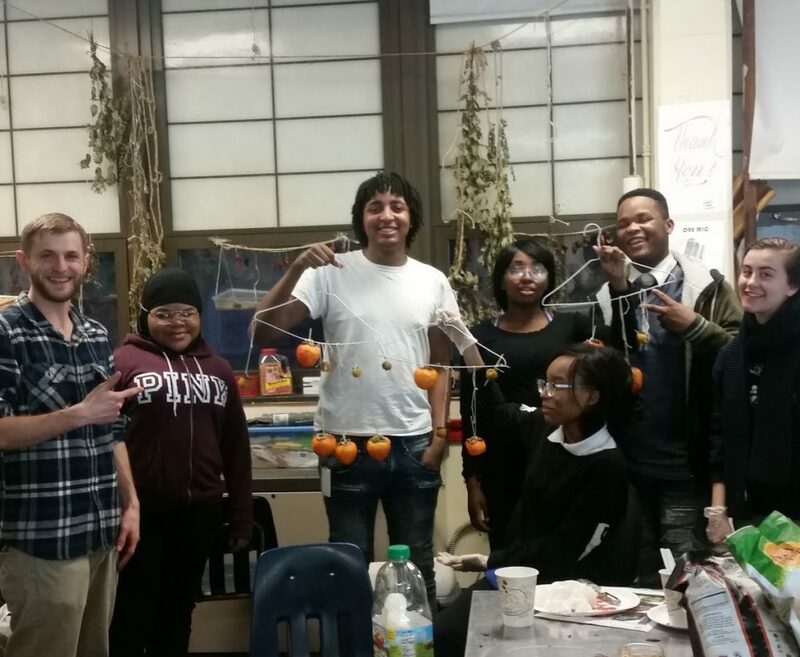 Students at Sayre High School in West Philly and Richard Allen Preparatory School learned the Japanese traditional persimmon string-drying method of hoshigaki. We experimented with the astringent Hachiya and non-astringent Fuyu varieties, finding them to work equally as well, and less so with the American persimmon, whose softer flesh makes it better suited for puddings and breads! 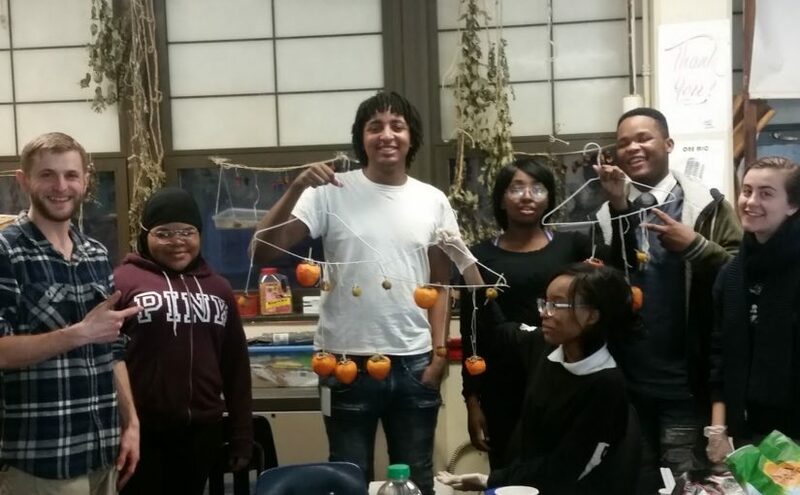 Sixth and eighth graders at Richard Allen Preparatory Charter School peel persimmons as the first step in string-drying, using the traditional Japanese method of hoshigaki. Two weeks later, students at Richard Allen Preparatory Charter School test the progress of their drying persimmons. In 2018, we also honored the life of Roseann McLaughlin, the beloved, foundational visionary behind Overbrook School for the Blind’s Farm-to-Table Program. 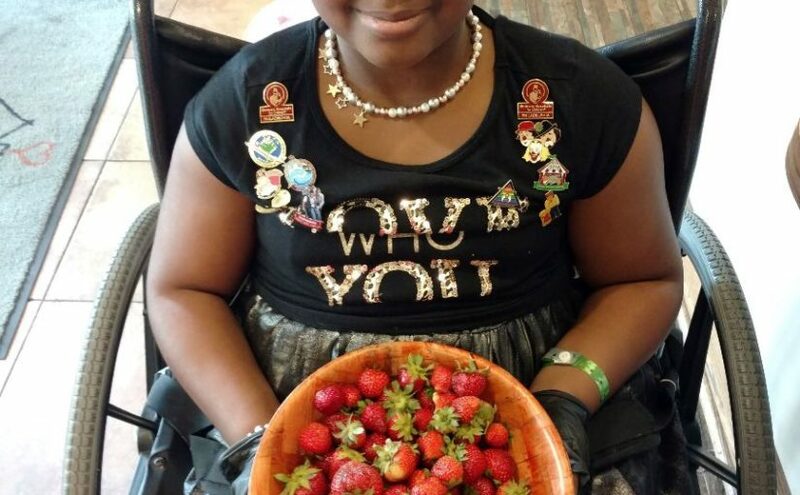 Continuing in her legacy through GrowAbility, we continued to work with a consortium of 10 organizational partners working to adapt orchard and agricultural curriculum for special needs students. POP created sensory lesson books and tactile prop boxes on honeybees, worms, apples, and herbs of the orchard understory, which are being adapted and replicated at partner sites all over the city. Overbrook School for the Blind’s Lee Stough leads students on a full sensory journey of the honeybee, using POP’s story book and interactive, tactile prop box. 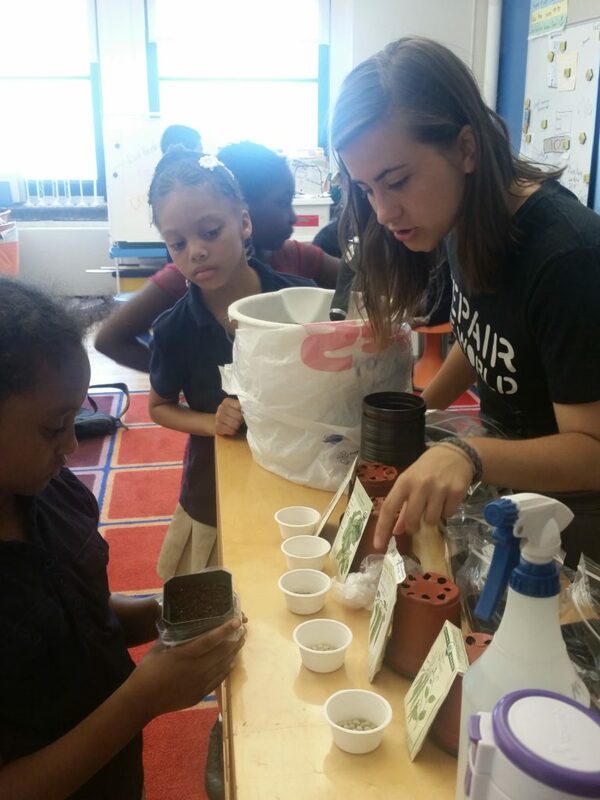 Using art, dance, and music, we delivered kinesthetic-focused lessons at new orchard partners like William Cramp Elementary School in North Philly, where students learned about root structures while tending to the weeds in their school’s orchards and danced the different structures they found! With support from Mural Arts, students also made collaborative exquisite corpse drawings, drawing themselves as part-humans, part-plants while learning about the functional parts of plants. 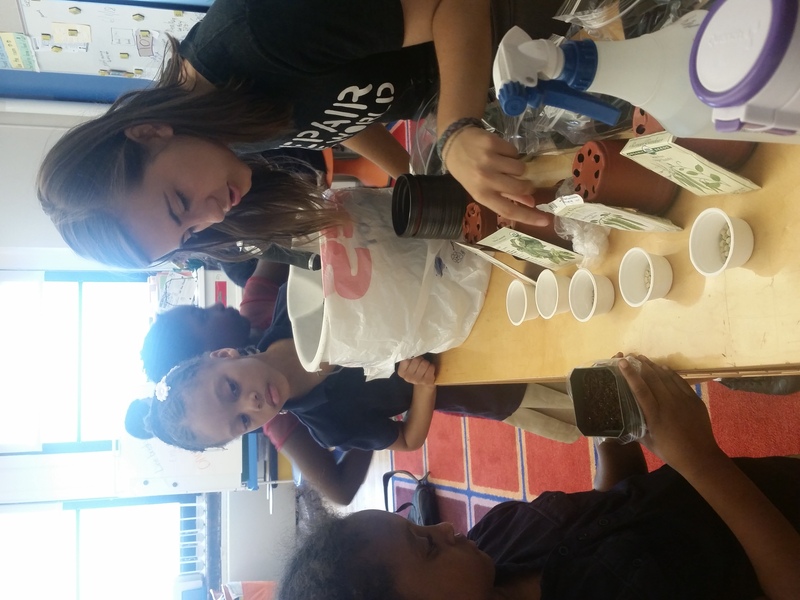 With retired-but-returning teacher Dr. Ruiz, an incredibly knowledgeable resource and student advocate, students learned how to make egg shell gardens and how to seed plants from avocado pits, a common staple for many of the school’s students. We continue to use art to facilitate students’ understanding of the natural and built environment. Cramp Elementary School’s Dr. Ruiz prepares for a lesson on egg-shell gardening with 4th grade students. In 2019, POP’s School Orchard Program has identified two key learning initiatives: education around protecting pollinator habitats, and work on natural dyes and pigments. This winter, we’re welcoming 4 undergraduate environmental studies students from Swarthmore for 10 weeks, who will be working with us on researching the crisis of pollinator population decline and ways we can intercept through the seeding of useful host plants. We’ll be working on a large seed ball project to seed these plants in the gardens and understories of our school partners, in addition to making these resources available to the wider community. We’ll be piloting a natural dyeing component with several schools this year, which will include a fall student showcase. This year we’ve also begun to work more closely with the Mayor’s Office of Education; through their work with community schools and includes several of our school partners, we’ll be creating a database of some simple garden projects for teachers and students, and sharing our newly created nutrition and recipe cards for use with classrooms and school food pantries, available in both English and Spanish (with special thanks to Camille Crane of Casa del Carmen for translating!). Every year we ask our orchard partners to reflect on the season and to share stories with us about what the orchard provides for their community. Below are some of our favorite excerpts from 2018 celebrating the beauty, abundance, and power of city orchards to serve as an engaging place of discovery and connection. Community youth harvesting apricots at the Norris Square Neighborhood Project orchard this spring. This spring we had a fruit harvesting day with our Garden Kids program, an informal weekly program for neighborhood children ages 4-12. With berry baskets and a fruit picker donated by POP, 10 youth harvested service berries, mulberries, strawberries and apricots. The young people loved using the fruit picker to try and get the best apricots from the tree. Many of them hadn’t eaten these fruit or picked them fresh before. It was a sweet, lovely day! Students LOVE the fig trees! It is really beautiful to see the joy, empowerment, and team work the fig trees on site bring out in the students. Kids worked together to scout and harvest them, encouraged each other to taste, and spread the word throughout the school that figs were “lit.” Even hesitant tasters became fig advocates to others in the school. 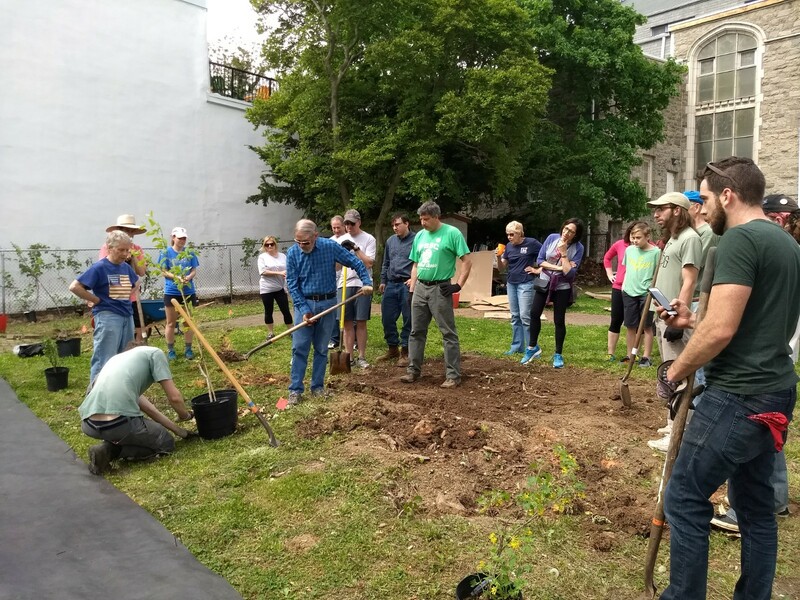 Those trees were the first plants they ran to in the garden and in their shade the bonds of community – shared nourishment, flourishing and fun – were reinforced. Youth from all over the local neighborhood know of the orchard and we often overhear them saying that they are going to head down later…(after the farmers are gone) to get their apples, pears, etc. Although we are trying to limit the amount of picking without permission, we like when kids eat fruit from the trees. We have often used these teachable moments to talk about when food is ripe and to think about others when picking to ensure all can taste and try. 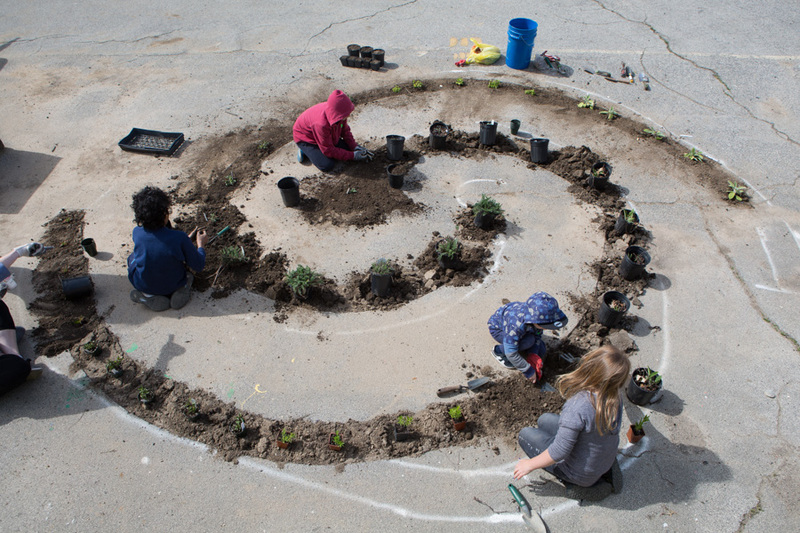 Students and volunteers planting a spiral herb garden at Cramp Elementary School in North Philly this year. We have three cherry trees that give us a TON of fruit. During the growing season, I have random neighborhood kids who will come after school and help me at the farm, or play in the garden, and those kids come during cherry season and spend afternoons climbing the tree and gorging themselves on fresh cherries. This year we finally got figs! After years of watching and waiting, our patience finally paid off. We are reminded that we plant these trees not knowing if we will taste the harvest but having hope that someone will enjoy their fruits. Krishanta, a 10 year old patient from Trinidad, and her mom Kizzie have been staying with us for a long time (over 7 months). 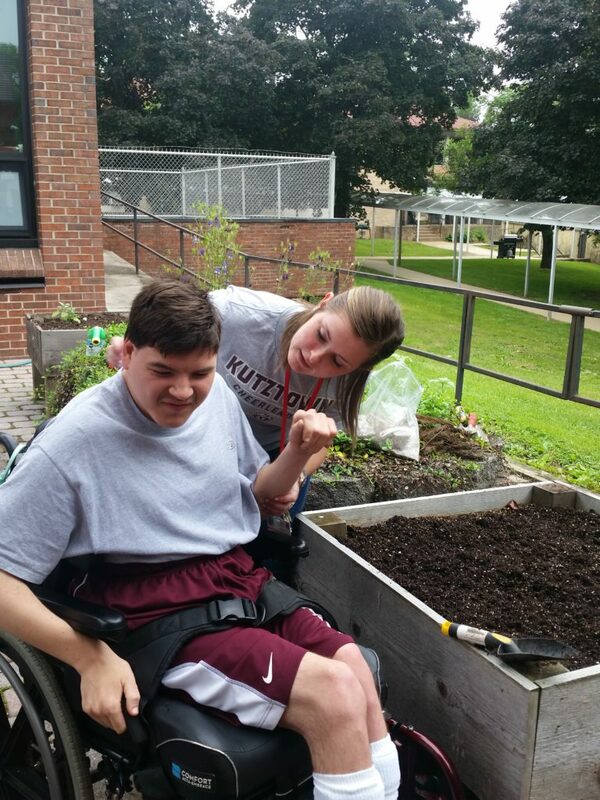 Krishanta uses wheelchairs and other mobility devices but it didn’t stop her from being our garden elf. She loves strawberries and it became her job to harvest the berries for us when needed. And then she took on the raspberries when they came in season. Soon she was helping volunteer groups with weeding and tending the orchard and garden. She asked if we could plant peppers and more cilantro so we did! In fact, we planted a salsa garden (tomatoes, jalapenos, cilantro) in with the herbs. I was lucky enough to spend some time with her in the garden I would let her smell the different herbs and explain their uses. Together we would harvest the herbs to put in the kitchen for other families and our guest chefs to use. 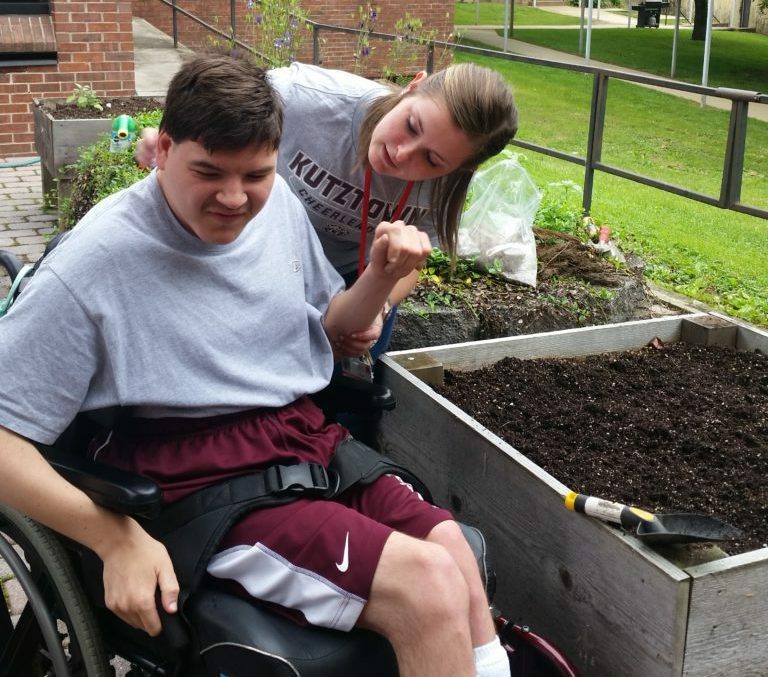 Krishanta was one of many this year to appreciate the bounty of orchard plantings at the Philadelphia Ronald McDonald House @ Erie. POP is willing, able and enthusiastic about interfacing with any single segment of Wyck’s constituents–whether corporate volunteer groups during our planting events, or high school job trainees during maintenance events, or behind the scenes with me, essentially empowering me to be informed and knowledgeable enough to train others and truly pay the orchard concept forward. They are a remarkable and generous and truly collaborative organization. Overcomer Eric from the recovery program is one of the dedicated volunteers for our farm/orchard. We have been able to help him to gain more interest in farming, growing and harvesting fruits. Now he makes sure the farm is doing fine even when we are not there working. His favorite fruit is the figs that he picked himself from our tree. Many gardeners expressed in one way or another that our orchard — particularly our raspberries, which persisted well into fall — enhanced their experience of being in the garden this year: through the joy of having fresh-picked fruit to snack on during work days, or providing a rewarding activity for kids in harvesting fruit during their visits, or simply through enjoying the beauty of our young orchard plants and food forest throughout the season. 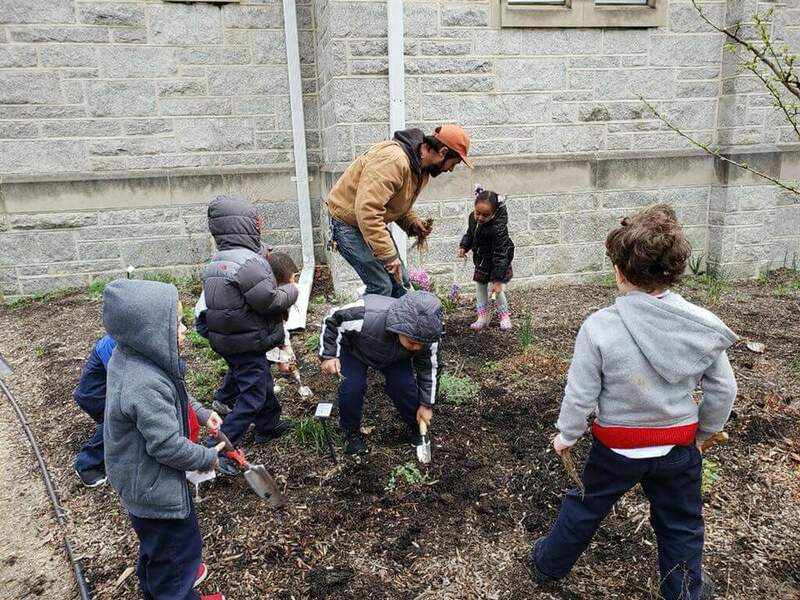 The Casa del Carmen orchard in North Philly demonstrated multi-generational involvement this year, including a spring strawberry planting with youth. 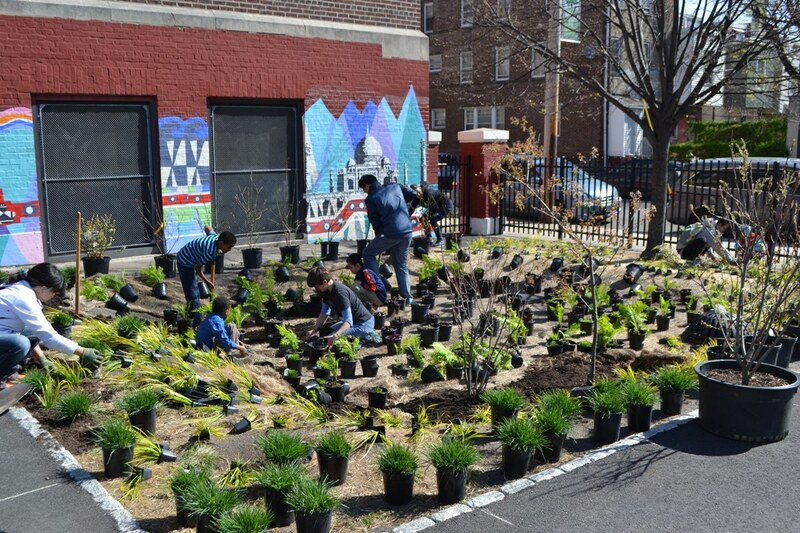 Casa del Carmen values our neighbors in Hunting Park and applauds the older adults that volunteer to care for the orchard. One senior in particular, a Puerto Rican Evacuee whose home and garden was washed away during Hurricane Maria, visits daily to ensure the health of the orchard. 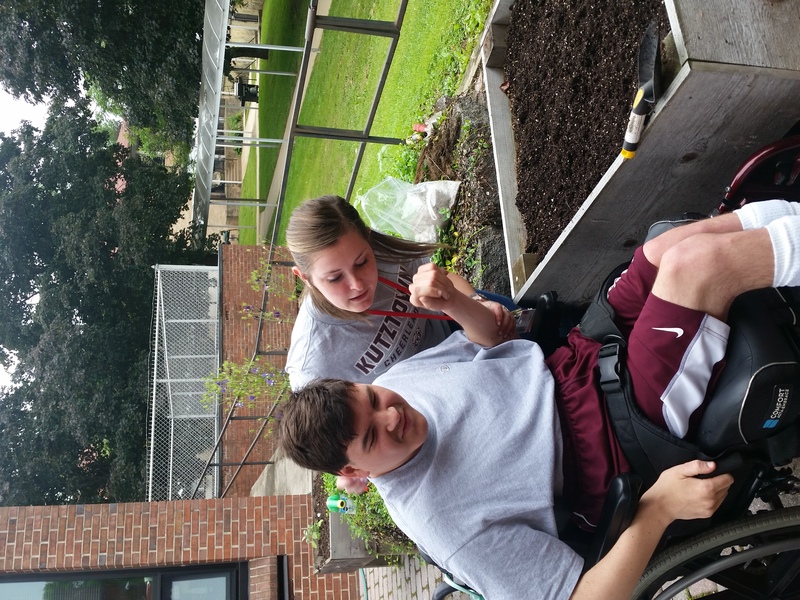 He says that tending the garden is recreational and keeps him active and healthy. During this past summer we were hosting the Lenfest Center’s summer camp garden club. On their first visit to work in their plot, most seemed excited to be at the garden. Ten minutes into their visit one camper wanted to go back to the center which is a 15 to 20 minute walk out of the park. She was not a fan of the bugs and heat that particular day but we were able to convince her to stay and not make the group leave. We adjusted the order of activities and decided to go first to taste the fruit in the orchard. She was very excited and wanted to take some home to have her grandmother bake a pie. Her next visit there was no hesitation to join in the scavenger hunt with the group. 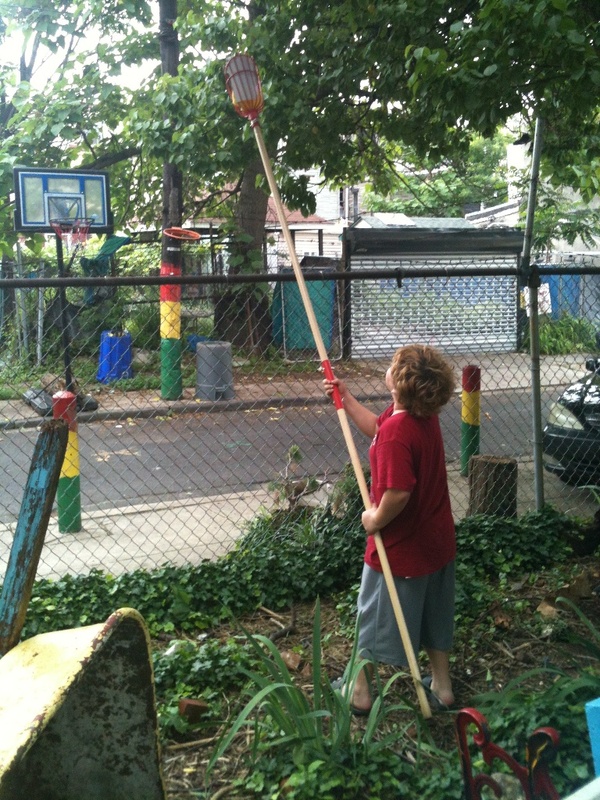 Each day our students roam the garden discovering insects, birds, and an occasional fruit. Our orchard is still young and doesn’t produce much yet, but the trees provide shade and for the first time we found Eastern Swallowtail Butterfly caterpillars in the garden. We are beginning to develop an ecosystem. The orchard is generally the highlight of the garden for the children who visit. Whether it is excitement at finding the sweetest apples, or getting lost in the raspberry bushes, the kids love it. Planting day with volunteers at the Union Baptist Church Garden of Eden in South Philly. We planted fruit trees and berry plants with POP this year. Our raspberry plants already have been producing large juicy berries. We have been harvesting the berries to share with our soup kitchen guests, church members, garden volunteers and neighbors. Some of the raspberry plants have grown out of the fence and people walking by pick the fruits. Some are worried about people picking them outside but our answer is “why not, that is the point of sharing and tasting the fruits we have grown”. One time a mother with kids walked by and were admiring the berries from the outside. We asked them to come in and gave them a tour and shared the berries. If we are near the plants, we will pick the berries and pass them over the fence for people who are curious about the fruits and our orchard. The orchard connected us to our community in many ways. Thank you POP for all you do and for our wonderful collaboration. Our orchard provides beauty and educational opportunities for our school community. We love spending time outdoors learning from nature! 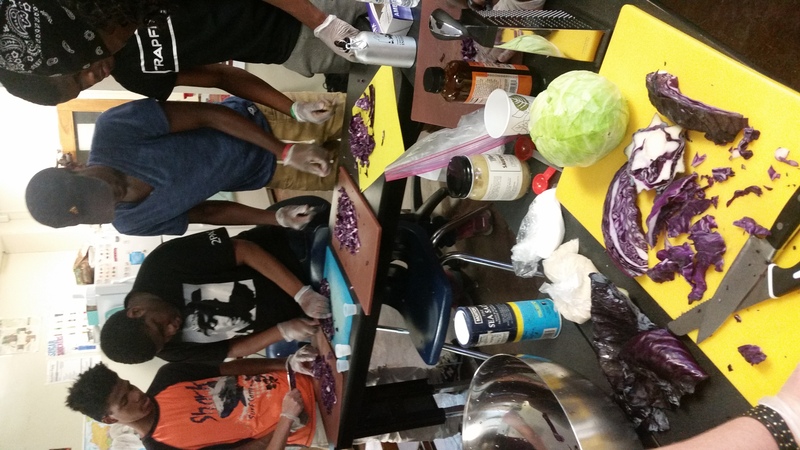 POP developed a series of sensory-based lesson plans this year in partnership with the Overbrook School for the Blind. We had a particularly good paw paw season. There were so many staff, volunteers and customers who had never had one before and were just floored by the taste. This is the second season we have had paw paws to sell at our farm market and people were already contacting up in the spring asking us when they could come and purchase them again this year. I have witnessed first hand the impact this one fruit has had on our immediate community, and it is creating quite the following of excited fans! This year our trees were still establishing and did not yet give fruit. It was a pleasure taking care of them throughout the season. Our berry bushes were the stars and produced a huge harvest. 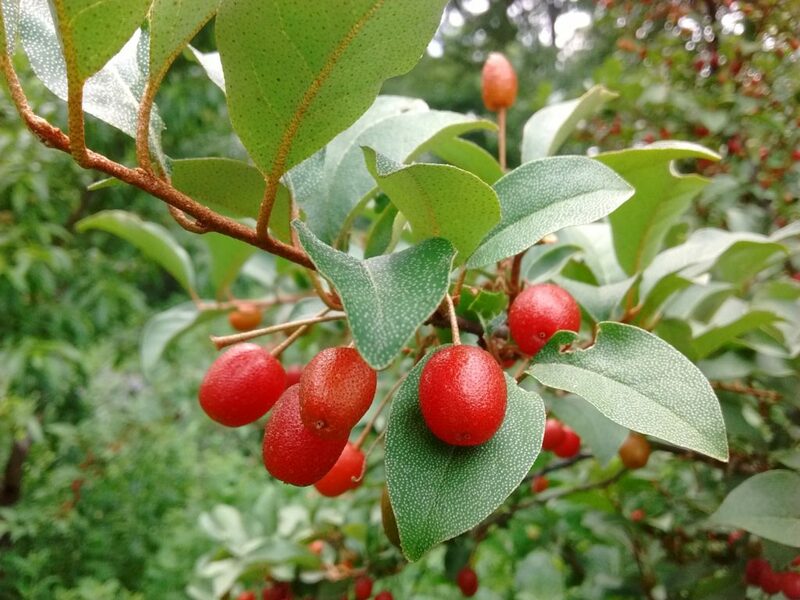 Our orchard is opened to the public, and the berries went super quick this year as and more people have discovered our little orchard in their neighborhood and feel comfortable harvesting. The abundant harvest of our cherry trees is a highlight of the year. 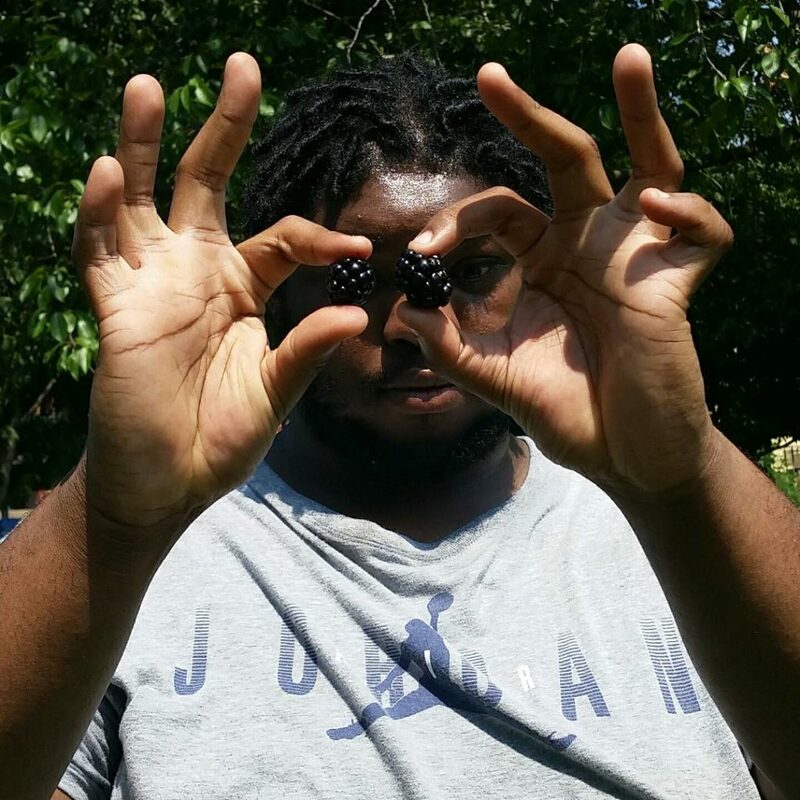 Youth experience harvesting large amounts, process some into jam, and provide these things to a community that eagerly awaits. This space has been especially valuable to the Master Gardener program for educational and volunteer opportunities. 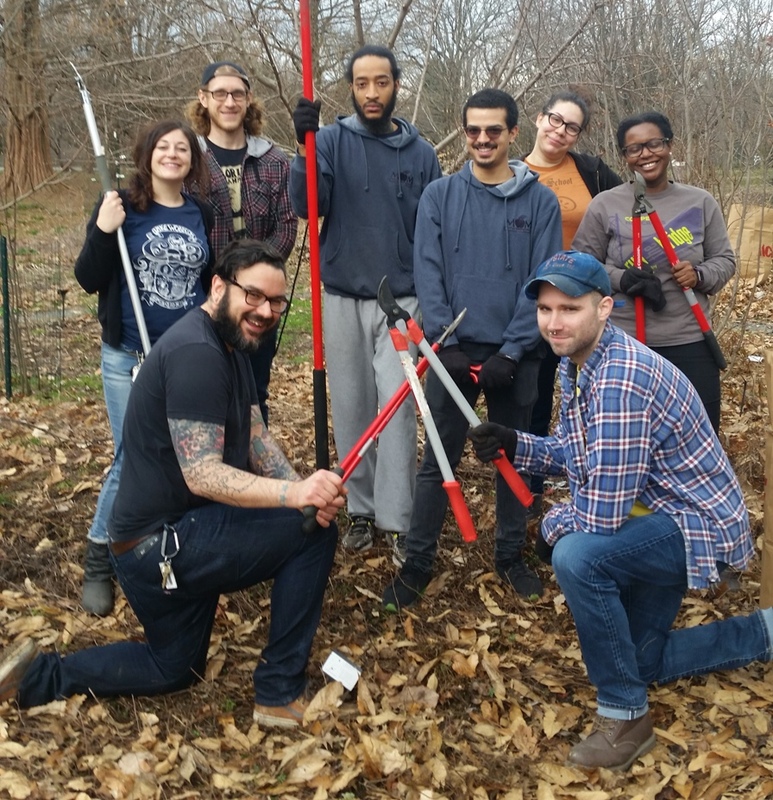 A wide range of volunteer groups assisted in caring for the food forest at the Fairmount Park Horticulture Center this year. In the orchards third year, it appears to have matured in the last season — the space looks a little fuller, not quite producing fruits yet, but the trees are filling in more. Peaches were harvested this year, the persimmon trees look like they’ll resemble the tall bountiful neighborhood persimmon trees, which is exciting to me, because I want our NE neighbors to recognize that just like many of them devote their tiny lawns/yards to growing food vertically or with fruit trees, that we also see the value of using our space for food and fruit production. We are transforming our campus into an edible landscape, and the children are recognizing it and asking questions, which is all I could ask for. This year we had a rough season with our fig tree (especially compared to last season). A neighbor of ours stopped by to check in about the state of the fig tree. He shared that when he was growing up on the block, there were a ton of fruit trees lining the street. It was nice to hear how this orchard is a continuation of a history that is still alive for people. Our residents saw a lot of changes this year. But, having the orchard remain has meant a great deal to our long-time residents, especially those whose windows look out over the trees. Several neighbors stop by to ask when the figs and cherries will be ripe and if they can help with them. They love to know that these fruits grown in their neighborhood! Every year we ask our orchard partners to reflect on the season and to share stories with us about what the orchard provides for their community. Below are some of our favorite excerpts from 2017 celebrating the beauty, abundance, and power of orchards to serve as an engaging place of discovery and connection. We have three sweet cherry trees that had a great harvest this year. Fruit gets a lot more attention & excitement than vegetables, which spread to our surrounding community. The cherry harvesting was a large gathering event, and we had people of all ages picking off cherries. 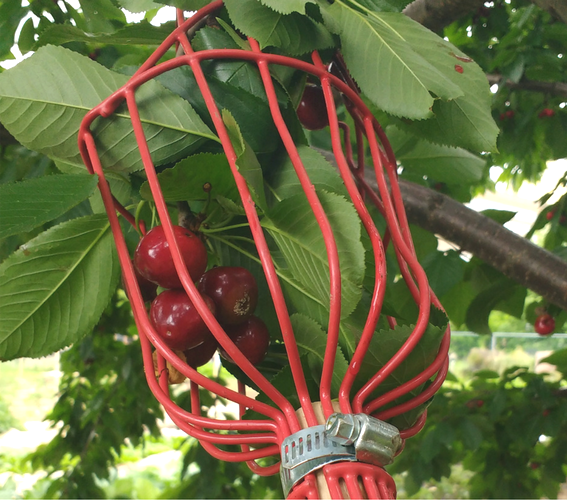 Many people did not know that cherries came from trees. A lot of neighborhood children got to climb the tree to pick off the cherries, which one of them told me was a “magical experience”. 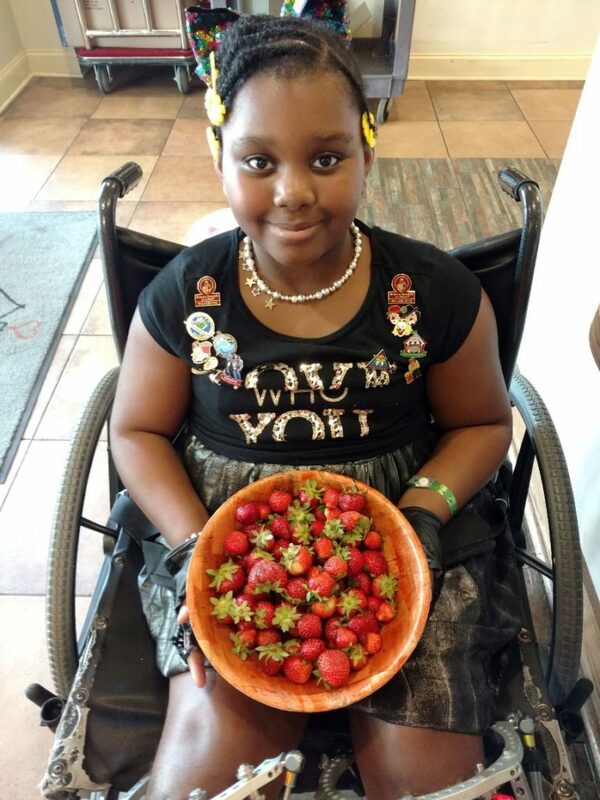 We had a family stay with us from the midwest with a 10 year old wheelchair bound patient. The patient was upset because she had to miss her field trip to a farm while she was in Philly receiving treatment. We asked her to help us pick strawberries and June berries from our orchard. She was very happy to help! Later in the season we had quite a few international families staying with us. The families loved to cook their own food. 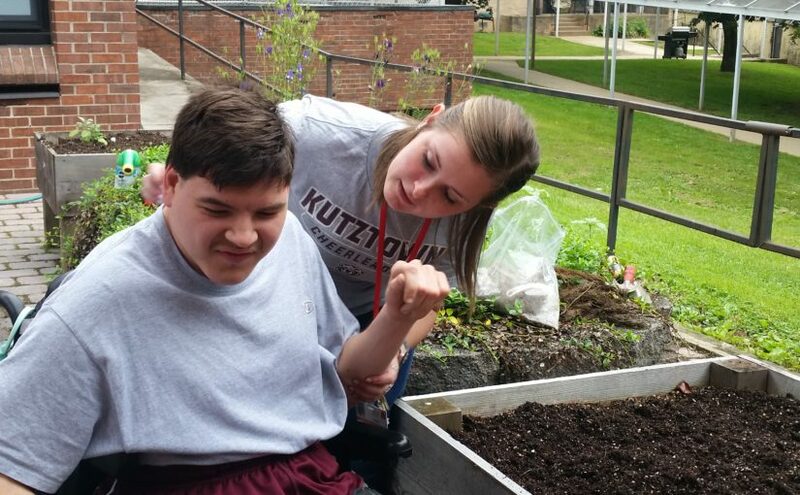 We introduced them to the herb garden and they loved it! A few of the families used the medicinal herbs for teas and poultices. Many families, staff and volunteers were able to taste a fresh fig for the first time! They were all surprised at the difference between a fresh fig and a fig newton. This year was one of the largest peach harvests we have ever had. Our students had an opportunity to make peach cobbler with freshly harvested peaches and many neighborhood residents were regularly harvesting peaches for their families. Along the edge of the garden we planted a row of raspberries during the Spring planting. They filled out wonderfully and bore tons of fruit all throughout the growing season. 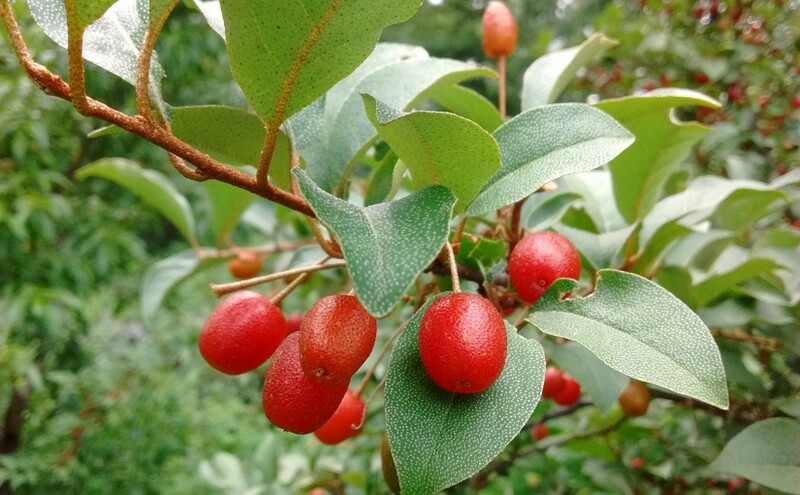 Our gardeners were delighted, and several of them who manage their diabetes, were especially happy to have a source of a healthy berry sugar substitute. Because we don’t have a fence, lots of visitors to the garden got to pick the berries and partake in their delicious flavor. Their taste often surprised people, not at all the store-bought berry! Berry vision at Overbrook School for the Blind! This year our Fig trees did well and the two students who were working Farm to Table were very excited. They graduated but came back to volunteer for our Garden clean-up weekend and they were thrilled to see all the ripe figs. 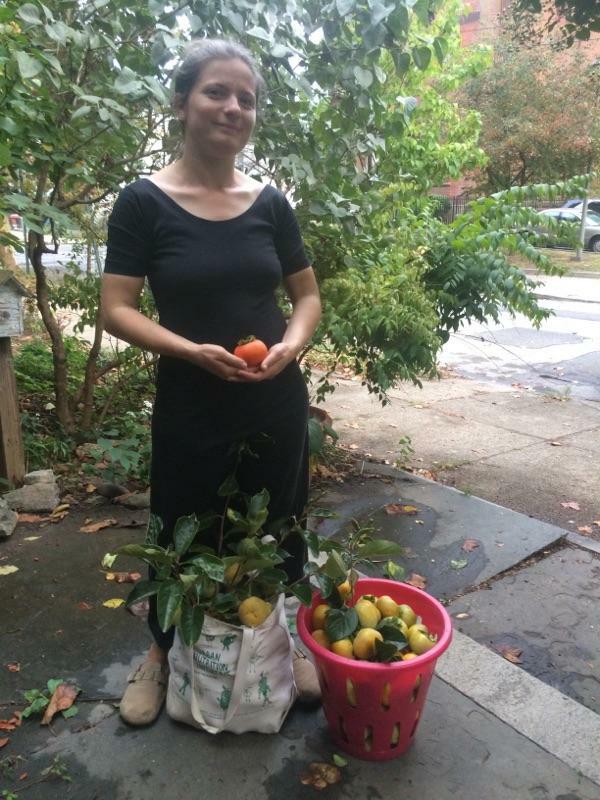 They harvested the figs and Anthony’s Restaurant in Drexel Hill agreed to buy them. The 2 students went with the staff person to deliver the figs to the restaurant. The students were very proud and excited. Anthony’s even put a picture of the figs on their website! I can tell you from first hand experience that the fruits from the orchard are a huge draw for visitors at the Ag Village. Youngsters are much more inclined to try fruits or herbs, than they are vegetables. 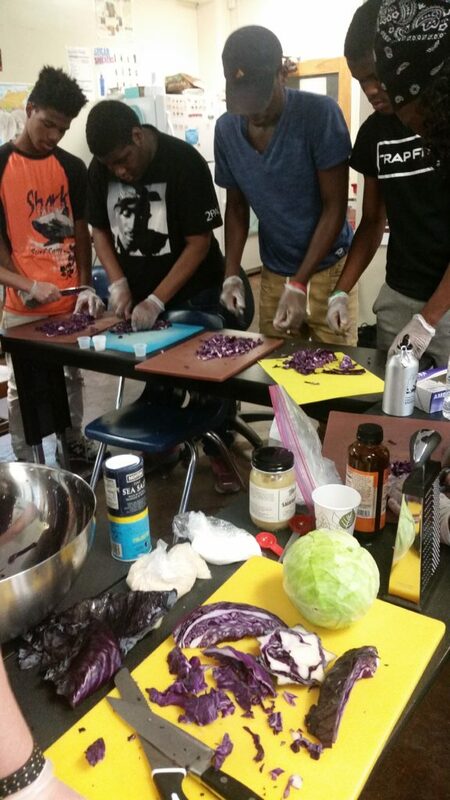 Volunteers from Teen Inc said “no thanks” to veggies but specifically asked for fruit to try. POP’s figs were just the ticket. That was their snack after a couple of hours of volunteer service late one afternoon in September. The kids were so grateful, more so I feel, then if I gave them something “packaged”. That fig tree is like a burning bush in the desert! 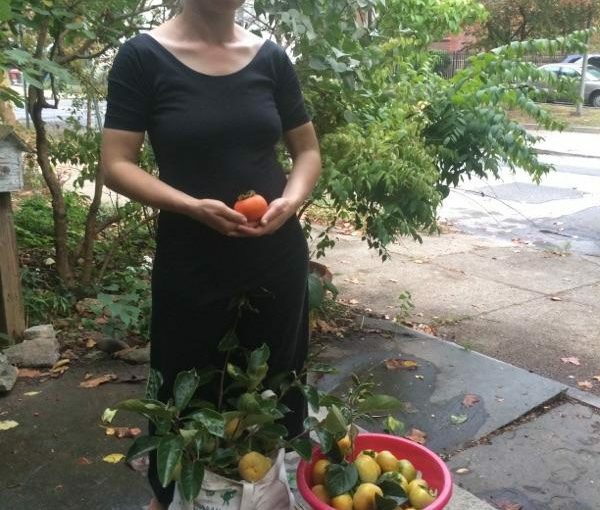 Everyone loves to stand around it to pick and eat the fruit, and because it fruits over a long stretch of time, and the fruit is often in various stages of development, I like to describe how to tell when the fruit is ripe. Abundant persimmon harvest at Preston’s Paradise in Edible Belmont. This was by far the best year for our paw paw trees! We introduced the fruit to so many people at our farm market. People who were already familiar with the fruit were ecstatic to see it on the table, and people who were not familiar with it were intrigued to give it a try! The week after memorial day, it had been raining all weekend, and my first day back to the orchard I noticed a bunch of clumps under our oak trees in our wood chip patch. Upon further inspection, the clumps were loads of wine-cap mushrooms!! We had inoculated the wood chip patch in the orchard the previous fall, but I had all but given up after I had expected mushrooms to come up in April. That week, our Cook for a Friend program prepared loads of wine-cap mushroom soup and gravy with our meals that benefit homebound older adults. The mushrooms were gorgeous in color, tasted great, and kept coming up for a couple of weeks — it was such a delight!